I recently had the great opportunity to blog for one of my favorite organizations: Project for Public Spaces. If you’re not familiar, you should be. Project for Public Spaces is a non-profit dedicated to create and sustain public spaces that build stronger communities. There are some cities doing wonderful projects that are putting life back into under-utilized streets. While I love reading blog postings on this site, I was always frustrated because we’ve been doing some pretty cool things here and more people should about them. So, here it is. I don’t remember exactly when this passion (mixed with mild-obsession) began with wanting to re-create a city prioritizing people instead of autos. I’m sure the birth of it began while living in San Francisco in the late 90s/early 2000s. I had no need to own a car; I biked, bused, walked everywhere, and everywhere you went, people were around. Life was constantly happening in the streets. I remember I experienced my first diagonal crosswalk on New Montgomery Street and I thought it was the coolest concept, but also such an “A-HA!” moment: Convenience. I moved back to Columbus in 2002 and quickly realized I wasn’t in “convenience, multi-modal-land” anymore. I bought a used car. My car did its job for a good six years. During that time, I would attempt to bike to certain destinations, but quickly learned first-hand how unfriendly our streets were. I also realized that when I was living in San Francisco, I used my bike as a mode of transportation – not merely as a recreational item when I merely felt like it. I didn’t fully grasp this until I moved back to Columbus and experienced how much harder it was. You see, in a city as dense as San Francisco, with its various integrated modes and speeds, drivers always have to be aware and drive more cautiously. In Columbus during that time, you rarely saw a person walking or biking; cars were the dominant mode and like the majority of cities and towns across the U.S., streets were designed to seduce you to speed. I’m all for being seduced but not while biking on an arterial road that I have to “share” with cars going 40 mph. As it turns out, history ALWAYS finds a way to repeat itself. Adult onesies are hotter than before, video arcades are the “in” place to hang out, and also revitalization – yes, revitalization – to resuscitate a space that’s lost its vigor, is having a comeback in a major way. In the past ten years, we’ve seen a boom in Downtown Revitalization Projects that are attracting people to once again move in instead of out. Columbus is one of those cities and we’ve made incredible strides in the past ten years. We have an amazing urban park in the center of our downtown that fills with life and concerts and various organized sports during the spring, summer, and fall months. We have a riverfront that has been transformed into a destination (and is currently being expanded) for residents and tourists with a cityscape view that’ll take your breath away. And in 2014 our downtown living soared from 4,000 residents to 7,000. People are coming back and I’ve loved watching our downtown find its heartbeat again. So, where do I come in? Well, I love Columbus but one thing has constantly nagged me about this city: One of the most repetitive adjectives I hear when people describe Columbus is, “potential” – including myself. “Columbus has such potential if only…” I want to stop being an awesome city IF and start being an awesome city that IS, and that means DOING. So, with a little talent, hustle, and guts, I’ve been DOING. The concept of Placemaking here in Columbus is only about four years new. 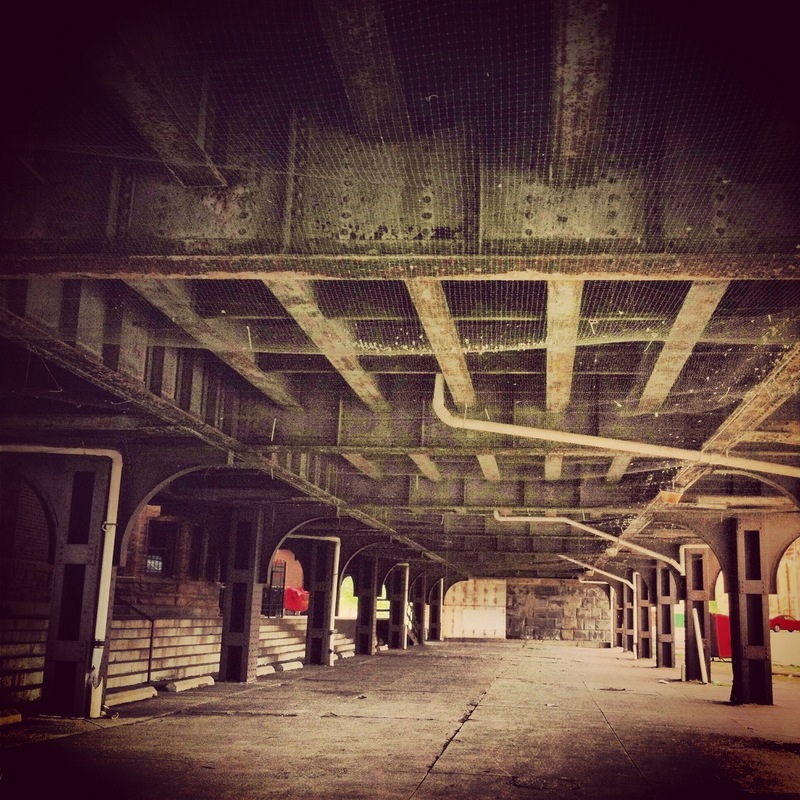 One of the “primer” projects that opened up people’s eyes and minds to the possibilities of what could be was a 2013 project called CBUS FOTO. This collective engagement project organized through Columbus’ Center for Architecture and Design, and led by the vision of Michael and Sarah Bongiorno with a group of talented young designers, asked citizens of Columbus to photograph empty, overlooked spaces and buildings in the city and come up with creative ways on how to fill them. The hope was to inspire citizens to understand that we are surrounded by under-utilized public spaces. These “overlooked” public spaces that we walk through every day and bike past everyday are blank canvasses awaiting rejuvenation. The value of this ephemeral project activated people’s imagination to see public spaces differently, as more than meets the eye. 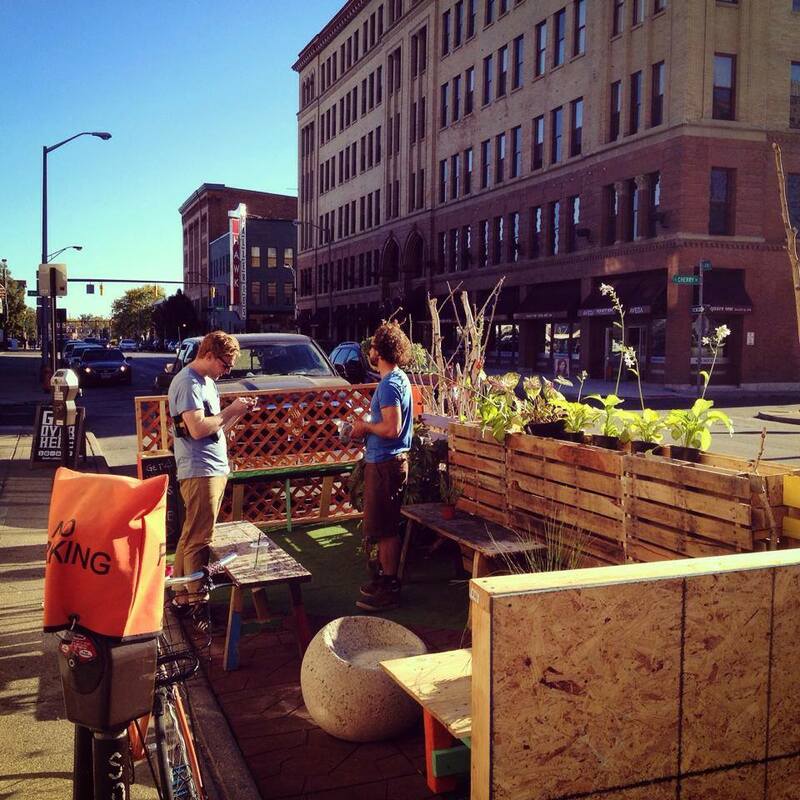 I fell in love with parklets years ago. I remember when I was flying to San Francisco, one of my “to-do’s” was to “hangout” in a parklet. Let that marinate in your brains for a minute.I’m headed to another city and one of my destinations is a parking space. But, I was drawn to them and I knew people in Columbus would be drawn to them too. They were unique and exciting and I loved that people filled up the space in front of a business instead of one car.Life was added. 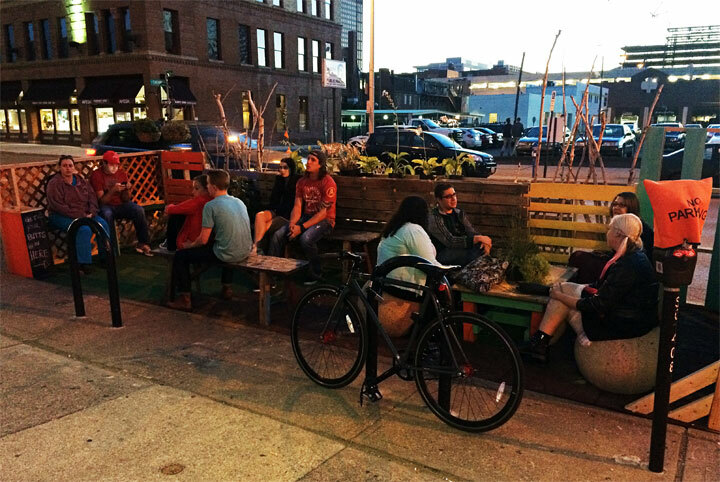 The Columbus Parklet Project creates small yet powerful actions that will continue to show people that streets have a “double-duty” responsibility – that they are necessary for getting us from point A to point B, AND they can be places. Another team I led was Open Streets Columbus. After three years of work and meetings and a lot of “no’s,” Columbus finally launched its first Open Streets event in September of 2014. We closed 0.8 miles of downtown streets and it became an urban playground for people of all ages (and wages). We’ve become submissive to the ‘Arrogance of Space.’ The Danish-coined term simply implies that there’s just too much space allocated to cars and drivers, and not enough for anything or anybody else. We’ve been told for so long that roads are made only to be driven on and outdated, myopic street design proves this. 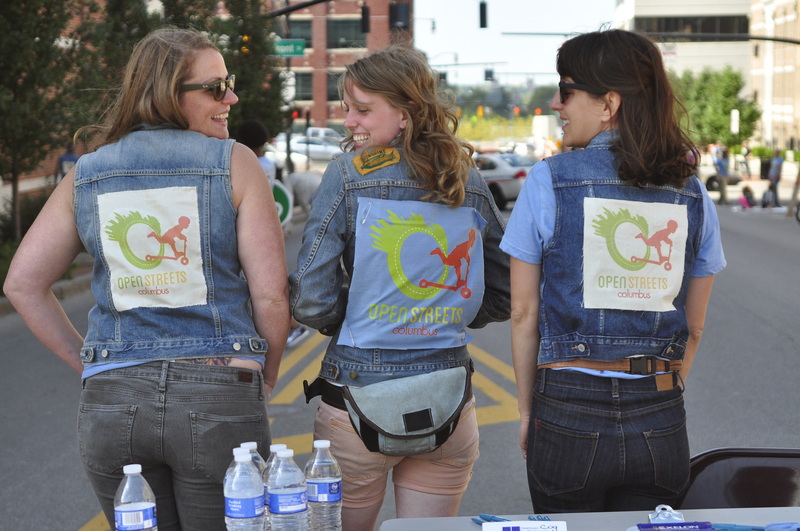 Open Streets initiatives turn the outdated thinking upside-down and gives the space back, allowing people to explore, connect, and realize on their own that equitable street design can happen. We had roughly 600 people come out and explore their city streets, free of all obstructions. It doesn’t sound like much but it was a great success, especially for a city that has a long way to go when it comes to bike/ped friendliness. The people who came out absolutely fell in love with Open Streets Columbus and in 2015, we’re planning to grow from one to two events. We are confident that with repetition and time, Open Streets Columbus will grow into a sustaining, thriving initiative every neighborhood embraces. Years in the making and worth every moment. I guess I wanted to write this blog for a couple reasons. I wanted to share some of our small successes here in Columbus because I’m proud of them and we’ve only just begun. I was tired of reading article after article about cities that are thriving, partially in part due to the presence of creative Placemaking projects and Columbus not being listed. Well, we now stand out, too, and I hope that can be an inspiration for other cities like ours. Lastly, Columbus has given me the support to take these risks. I say it’s a risk because for many people, especially decision-makers, as this is still uncharted territory. But, I believe these risks (and others) must be taken by everyone in order to not be a city that’s “status-quo.” I refuse to live in a city that’s “status-quo,” and I’m ‘all in’ to stand up to make the changes I want to see. We still have quite a ways to go but I think Columbus, and smaller and larger cities, are embracing the efforts of humanizing our streets again.